Just stop it already. Stop it! Stop fearing the pie crust. Do not buy ready-made. I beg of you!! You can make your own pie crust. You only need a few ingredients and a large bowl or food processor. I almost always have frozen pie crust in the freezer. We are coming into serious pie season with the Holidays approaching and it is so nice to have pie dough at the ready. You ready??? Here we go….. Note: for savory pies; omit the sugar and bump up the salt to 1 tsp. 2. 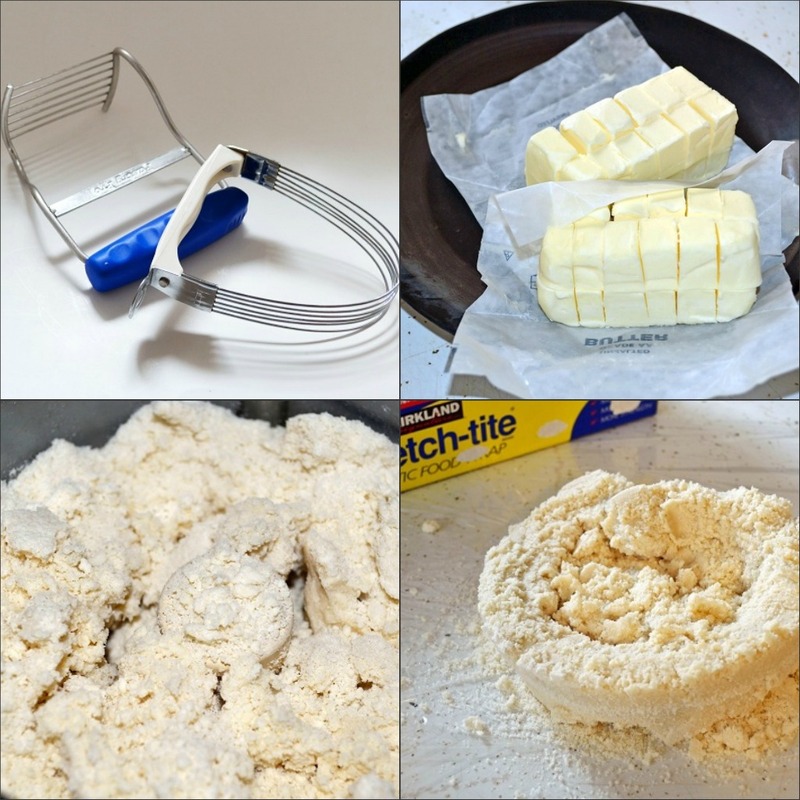 Blend in the cold butter with a pastry blender aka “pastry cutter” until the mixture resembles pea-sized meal. 3. Stir in the ice water- not all at once- start with 1/4 cup of it and add the water until the dough adheres to itself but is not sticky. Grab a large piece of plastic wrap and dump out the dough onto the plastic wrap and while grabbing the sides of the plastic wrap (don’t use your hands because your hands are warm) bring together the dough by pushing and pressing together the loose bits of dough until the mass is together. Cut the dough into two equal portions. Flatten each portion into a disk and wrap them in fresh plastic wrap and chill for at least 30 minutes before attempting to roll. You can freeze the dough also and keep it frozen for up to 2 months. If I make savory pie dough I like to simply label it “savory pie”. Suzie tip: write the recipe on an index card and tape it to the inside of your cabinet so it is handy. 1. In the bowl of a food processor, combine the flour, sugar and salt; pulse to combine. 2. Add the cold butter and pulse until the mixture resembles coarse crumbs wtih some larger pieces still remaining; about 10 seconds. 3. Ice water in hand; with the machine running, add ice water through the feed tube in a slow and steady stream, just until the dough comes together but not wet or sticky. Do not process more than 30 seconds. Test the dough by squeezing a small amount in your hand and if it is still too crumbly add a tablespoon of water at a time until it is the correct texture. 4. Dump the dough out onto a large piece of plastic wrap and bring the sides of the plastic wrap to help you bring together the dough until it is combined. Cut the dough into 2 equal portions and flatten out into round shape and wrap in fresh plastic wrap. Chill for at least 30 minutes or until ready to use. At this point you can also label them and freeze. Freeze for up to 2 months. My husband loves pies, and I love to make the filling, scared of the crust, so I love that you added pictures as to what it looks like. Will try soon. Monica, I know you will like the crust. Give it a try, and once you’ve made it a few times you will become more comfortable with it. Because after all, you are the “Pie Man’s wife” so you must prevail! 🙂 Suzie. Awesome recipe and very will written. I love how you give two ways to put together the dough…great tutorial. Thank you for sharing!